Hasselblad film magazines consist of two separate parts: the outer shell - containing the film advance mechanism and the picture frame, or film gate - and the insert - which consists of two spool holders and the pressure plate over wich the film is fed. 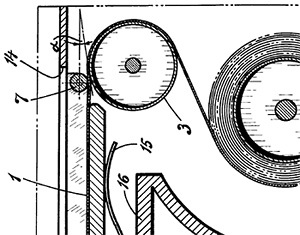 The relative position of the small rollers above and below the film gate to that of the rollers on either side of the pressure plate on the insert is instrumental in obtaining the best possible film flatness. After production of these individual components, shells and inserts are paired up, and adjusted as a pair, to ensure the best possible image quality. To reflect the fact that a particular shell and insert pair are matched, initially both shell and insert were given the same serialnumber. Later, the inserts were no longer assigned a full length serialnumber, but were marked with the last three digits of the serialnumber of the shell the insert was matched to instead. Despite being matched, inserts will still fit any shell, and matched pairs all too easily ended up separated and mixed up with other pairs. Mismatched magazines will still work, and despite the fine tuning, matched magazines do not produce results that are appreciably better, or even different, than the results produced using unmatched magazines. But though perhaps not a worry for 'working photographers', mismatched magazines do indeed fetch lower prices in the market, reflecting an appreciation for the meticulous way Hasselblad always paid attention to every detail, even the smallest. Below is a list of mismatched magazines, reported to Hasselblad Historical. If you have the missing parts for any of these, or are looking to find the missing parts for your mismatched magazines yourself, please do get in touch! Below is a list of mismatched sets and kits, as reported to Hasselblad Historical. If you have the missing parts for any of these, or are looking to find the missing parts for your mismatched set or kit yourself, please do get in touch! The HK 1 kit was supplied by Hasselblad to the Swedish armed forces, and contained a 508 mm Dallmeyer lens, a 1000 F camera, 3 film magazines, grips, finders, filters and other accessories, all packed in a plywood box. In a number of these kits, the items are engraved with the letters Ö.V.G. and the number of the kit, or the unit the kit was supplied to. 508mm Dallmeyer lens marked "ÖVG Nr 4". Hand-grips and filters in same kit are all marked "ÖVG Nr 3". Looking to locate the original "ÖVG Nr 4" accessories. "ÖVG Nr 3" accessories available if "ÖVG 4" set complete. Copyright 2008, 2009. All rights reserved.